EasyJet plc can confirm it has completed an agreement with Flybe Group plc to acquire 25 pairs of arrival and departure slots at Gatwick airport for a total consideration of £20 million. 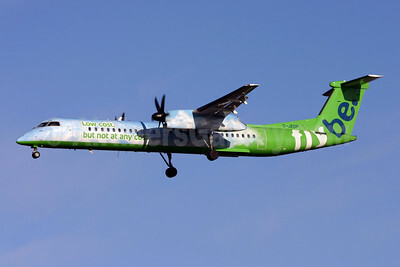 The acquisition is subject to the approval of Flybe’s shareholders. 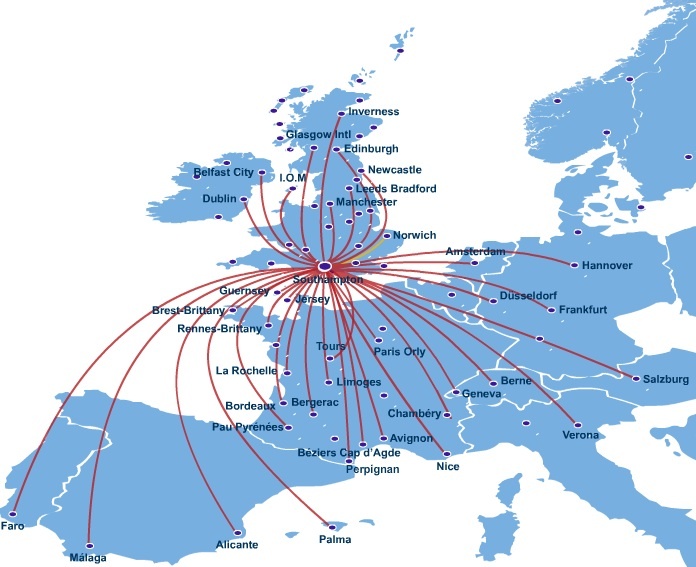 The slots will transfer from summer 2014 and will allow easyJet to provide additional frequencies on popular existing routes from Gatwick as well as add new destinations across the UK and Europe. 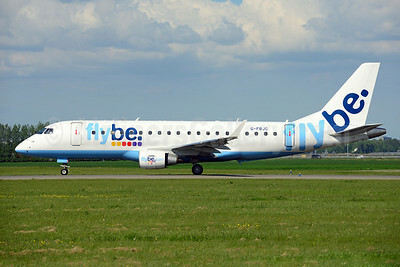 Flybe confirmed to the London Stock Exchange today at 0700 that it has sold its arrival and departure slots at London Gatwick airport, thus bringing to an end Flybe’s 22 year record of providing high-frequency air services from the UK regions to the airport. 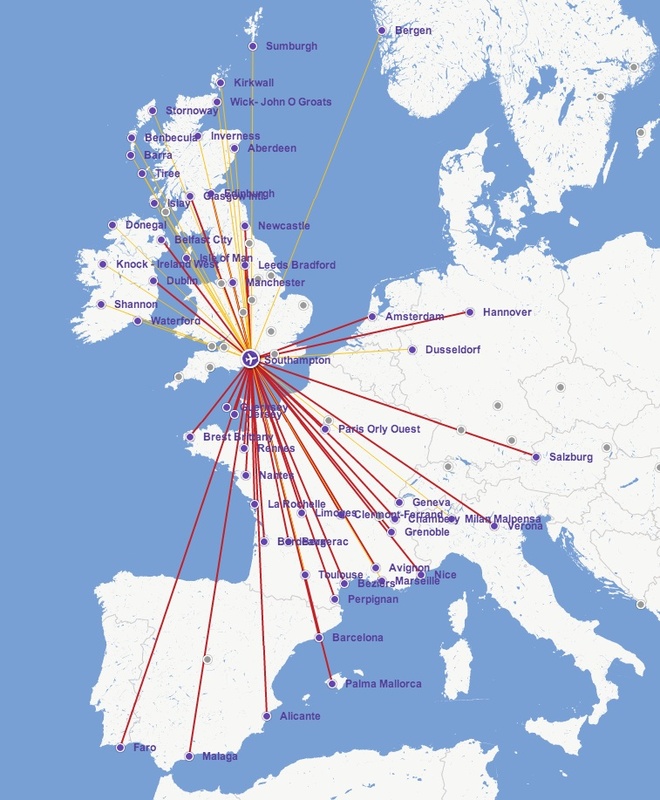 Flybe will continue to fly all its routes until the end of March 2014. The slots have been sold to EasyJet for a cash sum of £20 million. 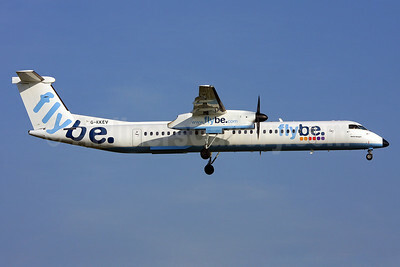 Flybe will continue to operate as normal all its seven domestic Gatwick routes – from Belfast City, Guernsey, Inverness, the Isle of Man, Jersey, Newcastle and Newquay – until Saturday March 29, 2014, with no changes to pricing, frequency or timings. 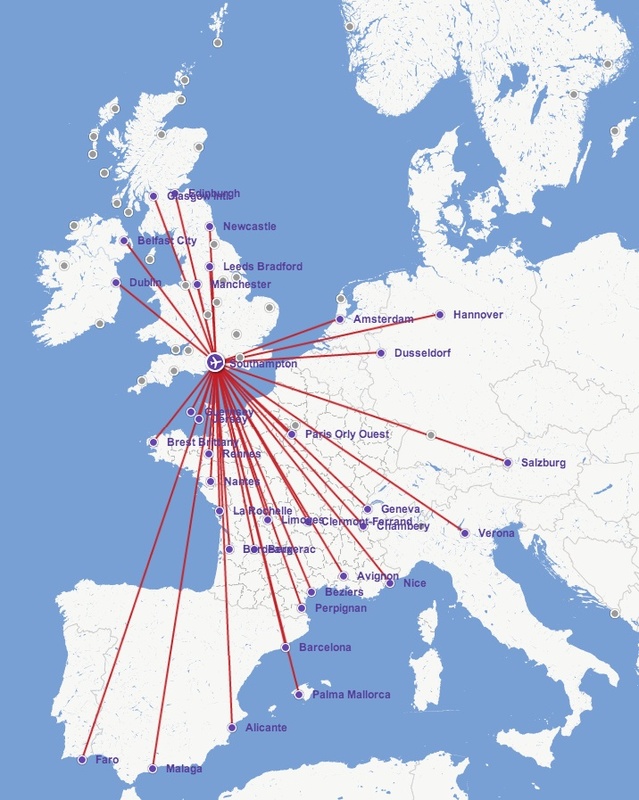 It also confirmed that there will be no impact upon any other route currently operated from those seven airports and that the funds generated by the sale of the slots will be re-invested in the remaining 159 Flybe routes. Top Copyright Photo: Antony J. Best. 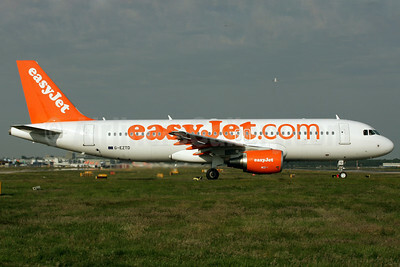 EasyJet’s Airbus A320-214 G-EZTD (msn 3909) holds short of the runway ready for departure from London (Gatwick). Bottom Copyright Photo: Keith Burton. Flybe’s Bombardier DHC-8-402 (Q400) G-JEDW (msn 4093) arrives at Gatwick Airport. This entry was posted in easyJet (UK), Flybe and tagged 3909, 4093, A320, A320200, A320214, Airbus, Airbus A320, Airbus A320200, aviation, Bombardier, Bombardier DHC8, Bombardier DHC8400, Bombardier Q400, British European, British European 2nd, civil aviation authority, DHC8, DHC8400, DHC8402, easyJet, easyJet (UK), easyJet.com, Flybe, flybe.com, Gatwick, GEZTD, GJEDW, LGW, London, london gatwick airport, Q400, transportation on May 23, 2013 by Bruce Drum. 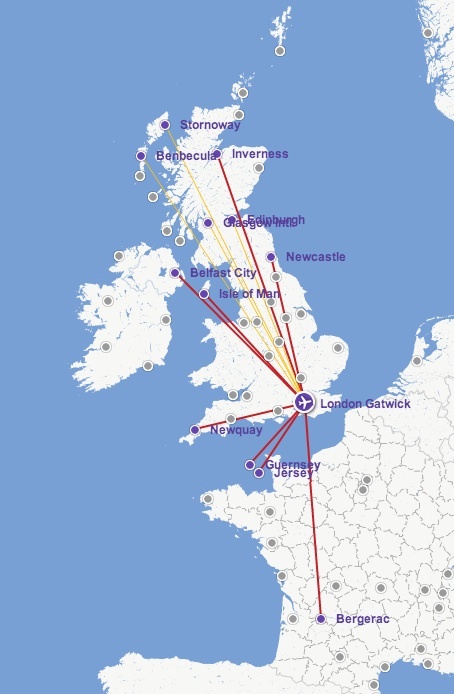 Flybe (Exeter) is reportedly in discussions with EasyJet (easyJet.com) (London-Luton) and others to possibly acquire its 25 landing and takeoff slots at London (Gatwick) according to this report by the BBC. 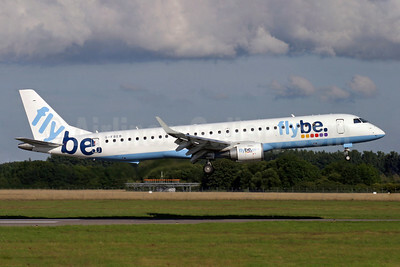 Flybe has been losing money and is currently cutting costs and selling some of its assets. Copyright Photo: Terry Wade/AirlinersGallery.com. Bombardier DHC-8-402 (Q400) G-JEDP (msn 4085) in the unique “Low Cost, but not any cost” color scheme approaches the runway at London (Gatwick). 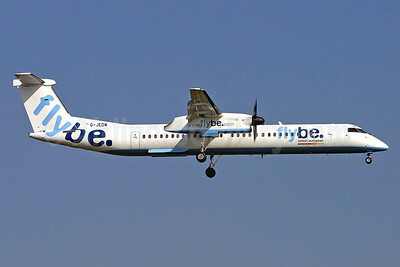 This entry was posted in Flybe and tagged 4085, Bombardier, Bombardier DHC8, Bombardier DHC8400, Bombardier Q400, British European, British European 2nd, DHC8, DHC8400, DHC8402, easyJet, Flybe, flybe.com, Gatwick, GJEDP, LGW, London, london gatwick, Q400 on May 15, 2013 by Bruce Drum. Medium term operational profit targets for the Group. A revised strategy to focus on two key sectors of the market – its UK scheduled services business, and the growing European contract flying market. Confirmation that there would be no change to its current route network, and that consumers will still enjoy the same choice of routes and airports. A cost reduction plan for its UK business and associated support activities which targets cost reductions both internally and externally. As part of the proposed cost reduction plan for the UK business, it is expected c300 roles will be made redundant. The total annualised benefit of the cost reduction plan will reach £35m. A review of the potential outsourcing of various support functions. The establishment of a new Flybe Outsourcing Solutions business bringing together its contract flying, maintenance and training divisions across Europe into one customer offering. A summary of the announcement is provided at the end of this release. As a result of the cost reduction plan announced today, Flybe UK has commenced the consultation process which may lead to circa 300 proposed redundancies. This would equate to approximately 10% of its current UK based employees. 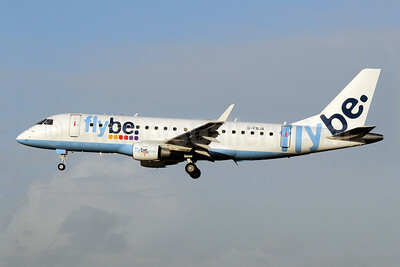 It is expected that the majority of the proposed redundancies will, following consultation, come from Flybe’s Exeter HQ, Manchester and Newcastle. Commenting on the plan, Flybe’s Chief Executive Jim French said: “Today’s restructuring plan for the airline has clear, two year profit targets which we believe are deliverable and realistic. A new, slimline business model for UK scheduled services underpins a turnaround which I expect will deliver a £3.00 per seat profit target in the medium term. Today’s announcement of a turnaround strategy for the UK business is a clear indication that Flybe has a plan not only to address the challenges we face, but also one to exploit the opportunities available, particularly in Europe. “It is a matter of great regret that many valued and hard-working colleagues may leave the organisation and it was a decision I and the Board have not taken lightly ; it’s one we have tried to avoid and it is the first time in almost 30 years of business that we have had to take such action. However, faced with the brutal impact of a 160% rise in Air Passenger Duty (APD) over the past six years and the consequent 20% decline in domestic traffic over the same period, we have to recalibrate the business. There is no escape from the £68M per annum APD tax burden which Flybe has to pay as a result of increases successive governments have levied on the industry. Flybe now pays more than 18% of our ticket revenues to the government in APD, whilst other UK based carriers who operate a greater proportion of their business outside of the UK pay less than 6%. Copyright Photo: Paul Denton. Embraer ERJ 190-200LR (ERJ 195) G-FBEL (msn 19000184) arrives at Geneva. This entry was posted in Flybe and tagged 19000184, aviation, British European, British European 2nd, Embraer, Embraer 190, Embraer 195, Embraer ERJ 190, Embraer ERJ 190200, ERJ 190, ERJ 190200, ERJ 190200LR, ERJ 195, Flybe, flybe.com, Geneva, GFBEL, GVA, transportation on January 23, 2013 by Bruce Drum. 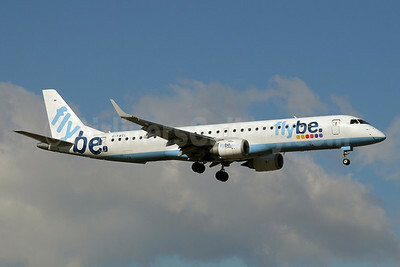 Flybe (flybe.com) (Exeter) swung into the red with a pre-tax loss of $10 million for its fiscal year ending on March 31. This entry was posted in Flybe and tagged 17000326, British European, British European 2nd, Embraer, Embraer 175, Embraer ERJ 170, Embraer ERJ 170200, Embraer ERJ 175, ERJ 170, ERJ 170200, ERJ 170200STD, ERJ 175, Flybe, flybe.com, GFBJA, MAN, Manchester, transportation on June 13, 2012 by Bruce Drum.